Kris Aquino claims "political reality" is the reason why TV networks won't hire her today. Is there politics involved when it comes to the TV career of Kris Aquino? The former host-actress claims "political reality" is the reason why TV networks won’t hire her now. Last January 31, Kris posted a video on her Instagram account featuring her latest endorsement for a local cosmetics brand. In the comments section, a netizen asked Kris why she has no existing contract with any TV station. "Bakit po walang kumukuhang network sa iyo Miss Kris, eh ang galing galing nyo po...every Filipino wants you to see in television." 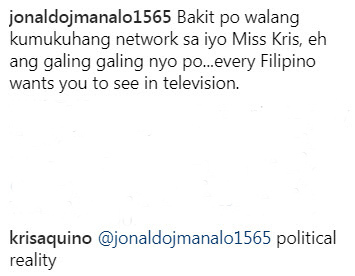 Kris responded by writing back: "@jonaldojmanalo1565 political reality"
Netizen @jonaldojmanalo1565 followed it up by writing another comment (published as is): "Exactly po Mam Kris, political reality...you have nothing to prove to anyone, you have proven long time and above all you are not just kind, you are a good person as well...basta we always support you. God bless po and we missed you on TV." Kris did not elaborate on what she meant by "political reality." It might be remembered that Kris was set to renew her contract with ABS-CBN in February 2016. However, she chose not to sign the contract offered to her at the time. Instead, she took time off to go on a family vacation in Hawaii and to deal with her health problems. When she came back in July 2016, she saw that ABS-CBN was not offering her a definite show and there was no assured time frame for her return to the air. 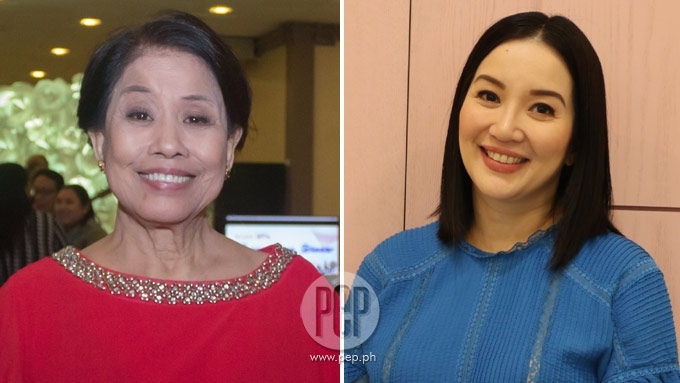 After 22 years of being an ABS-CBN talent, Kris confirmed in September 2016 that she was leaving the Kapamilya network. At the time, she said she would be working with Tony Tuviera of TAPE and APT entertainment, producer of the GMA-7 noontime show Eat Bulaga. In her Instagram account, Kris described her plans with Tuviera as follows: "What was an attempt at something new [and] experimental, evolved into a vision & a presentation that felt perfect for who I am now & for our TV collaboration." On April 9, 2017, Kris hosted the travel show Trip Ni Kris. This one-hour-and-30 minute TV show aired on GMA-7. Except for that show, Kris has not appeared on a regular TV show since leaving her former home network, ABS-CBN. Today Kris is an online personality with 3.3 million followers on Instagram, 1.1 million "fans" on Facebook, and over 148,000 subscribers on her YouTube channel. Kris is the sister of former President Benigno "Noynoy" Aquino III. Their parents are former Philippine Senator Benigno "Ninoy" Aquino Jr., who was assassinated during the Ferdinand Marcos regime, and the 11th President of the Philippines, Corazon "Cory" Aquino. 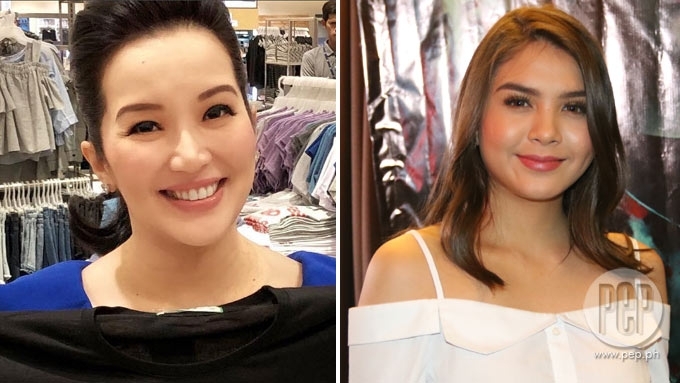 Kris Aquino to Kim: Ayaw namin ng hindi supportive sa 'yo. 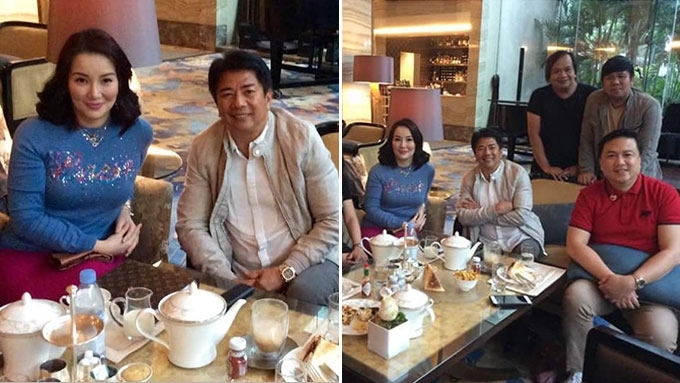 Will Kris Aquino co-host Wowowin with Willie Revillame?